Motorcycle accidents are dangerous, with statistics from the Insurance Institute for Highway Safety estimating that per mile traveled, motorcyclists are 28 times more likely to be killed in an accident than an auto driver or passenger. If you manage to survive a motorcycle accident, though, getting your bills paid can be another headache, as depending on the facts of your situation, auto insurance may not necessarily cover everything. In Pennsylvania, drivers must choose between two options when insuring their vehicles. One is called “limited tort,” they cannot (except in very serious circumstances) bring suit in court to recover medical bills or any other expense. The other is called “full tort,” where they can pursue remedies in court in exchange for a higher insurance premium. Motorcyclists, by Pennsylvania law, are automatically subject to the “full tort” provisions, meaning that no matter what, a motorcyclist may pursue a lawsuit against a driver that allegedly caused their injuries, and they may seek not only medical bills, but also non-economic damages like pain and suffering, loss of quality of life, and so on. This is important especially because motorcyclists, unlike auto drivers and passengers, are not eligible to receive first-party medical benefits coverage, even if their auto insurance policy states that such coverage is offered. Uninsured and underinsured (UM) motorist (UIM) coverage is another very important type of insurance which can cover a motorcyclist’s medical bills in the event of a crash. Depending on your insurer, you may also be entitled to “stack” this coverage – in other words, if you have more than one vehicle on a single insurance policy or multiple insurance policies, you can stack the amount of UIM coverage you hold, thus increasing the amount and giving you more leeway to have your bills covered if you were struck by an uninsured or underinsured motorist. Check your policy, but it is important to know this option exists. Motorcyclists are also eligible to purchase certain types of coverage that does not apply to autos at all – for example, trip interruption coverage, which handles costs like towing and alternate transportation if you experience a mechanical breakdown, or collision coverage, which specifically handles repairs on your motorcycle regardless of whose fault the damages might be. It can feel confusing that motorcyclists are ineligible for certain types of coverage simply because their vehicles are not automobiles, but at the same time, coverage is there if one knows where to look. When you have been in a motorcycle accident, all you want to do is focus on getting your life back to normal. 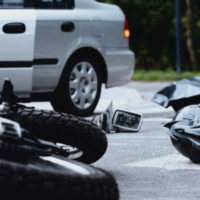 The Scranton motorcycle accident lawyers at the Needle Law Firm can help you negotiate with insurers, and if your case goes to trial, we can work hard to ensure that you receive the fairest and most appropriate outcome possible. Contact our Scranton office today; we serve most of northeastern Pennsylvania, including Scranton, Stroudsburg, Milford, Montrose, and Honesdale, among other locales.